This article and guide has been written with one purpose: Explain to you the most important things about aluminum recycling and its use in manufacturing gutters. This in depth overview is going to explain you everything about this process. We’re also going to cover important aspects like why it’s important, how does it help, etc. This process has a main goal: To convert scrap aluminium into useful products. The goal is simple, and its benefits are multiple. First off, it’s more energy-efficient and affordable to recycle this metal instead of creating aluminium. Recycling this metal consists in simply melting it again. Creating new aluminium requires a higher amount of energy and money, because it uses a complex processes which is based on the electrolysis of aluminium oxide. And this oxide is extracted from bauxite ore and refined using the Bayer Process, which also requires a significant amount of energy and resources. 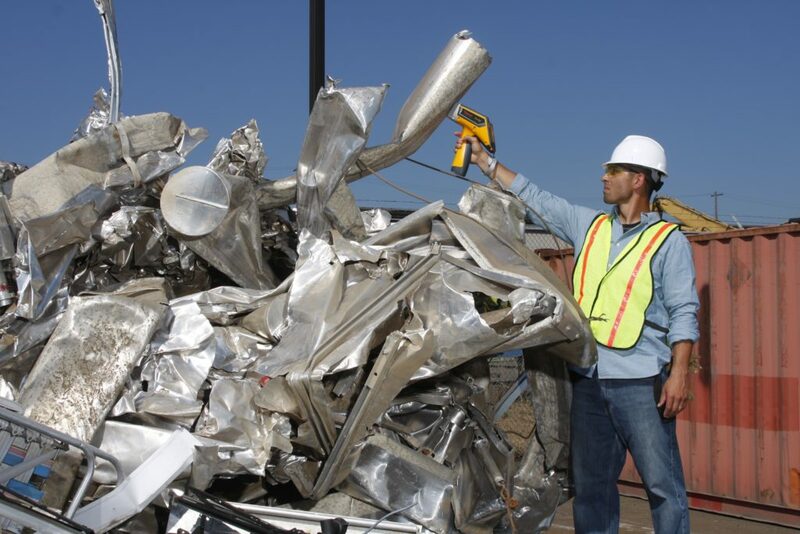 Recycling aluminium is a common practice for the reasons exposed before. That’s the reason why the 31% of aluminium in the United States of America is obtained through this process. Curious fact: The leading source of scrap aluminium are used beverage cans. Now we will go in detail with the advantages and benefits of aluminium recycling. We have already seen an overview on the advantages, but now we are going to go in detail. The typical process of creating this metal is expensive and requires a significant amount of energy. On the other hand we have the recycling process, which barely requires about 5% of the energy used in the traditional extraction and creation process. It’s calculated that the amount of energy saved by using this process is enough to power up to 4.4 million European homes. It alone brings a very clear vision on how much energy is saved by using this process instead of the traditional one. It also saves the energy used in extracting Bauxite ore. Every single year recycling avoids 5% of the mining of this ore. Hence an important amount of energy is saved thanks to recycling. So how does it affect the environment? It was pointed out that recycling cans are the main source of scrap aluminium. Approximately 50% of these cans are recycled every single year totaling 105 million cans a year. Such an enormous quantity would be enough to build approximately 70,000 Boeing 737 airplanes. This gives us a vivid and clear image on how much aluminium is saved. Even though every year 1.5 million tons of aluminium cans are wasted every single year, this practice of recycling this metal becomes more common and the amount of wasted cans will be reduced in the future. Another great thing about this metal is that it can be recycled over and over again without affecting its quality or composition. That’s why we still use 75% of the aliminium produced since the 1880s. It also helps the planet by reducing greenhouse gases. This industry produces an important amount of carbon dioxide, which can be reduced if this metal is recycled instead of fabricated from scratch. The smelting of this metal also produces nitrogen oxide and sulfur oxide, two other damaging gases which are part of acid rain and smog. This process can also be of great benefit for the local communities. This industry is reported to pay approximately 2 billion dollars every year for recycled aluminium cans. This money can be used to support several local organizations, churches, schools, etc. Herein lies a great opportunity for local communities which are looking for the acquisition of new funds. This is a never-ending campaign, because this industry is ready to buy all the aluminium cans possible. The US is still behind other countries like Switzerland, Norway, Finland and Germany which recycle up to 90% of these containers. Many companies are now utalising recyled aluminium in their manufacture of gutter systems. Bespoke Guttering use 90% recycled aluminium in their seamless gutters. The main reasons for this sharp increase in gutter production is primarily due to its lighweight attributes, coupled with his durability. This is particulary advantageous with the UK weather system. We have seen the great advantages offered by this process: It saves energy, resources and money, it helps local communities and also our planet by reducing the emission of greenhouse gases and creation of waste. But how are cans recycled? We’ll briefly explain this process under this section. First off, cans are properly filtered from municipal waste. For this step it’s normal to use a eddy current separator. Then the cans are cut to small and equal pieces, in order to reduce the volume and make it easier for the machines to filter them. All pieces are blocked and cleaned, either manually or chemically, with the goal of reducing oxidation at the hour of melting it. Blocks are prepared and sent into the furnace to be heater at approx. 750 C° to create molten aluminium. In this step the dissolved hydrogen is removed and the waste/rubbish eliminated. Usually nitrogen gas and chlorine are utilized in this phase. In this stage some samples are extracted for spectroscopic analysis. The actions executed here depend on what’s the desired end product. Based on this the following elements can be added: Zinc, copper, silicon, manganese and high-purity aluminium. The industry mainly works with 5 different types of alloys: 6061, 7075, 1100, 6063 and 2024. Finally the furnace used is tapped in order to pour out the molten metal. In this final stage the aluminium can be shaped into ingots, rods or billets depending on the end product desired. It can also be transported in its molten state for further processing/refining. The process is repeated for the next batch. 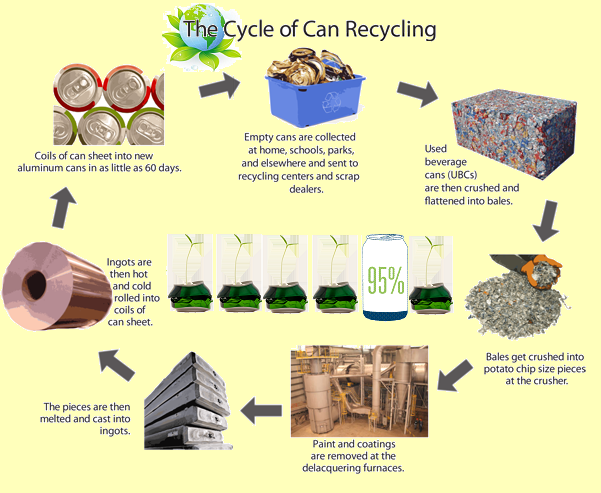 This is how used cans are recycled in this industry. This process requires a modest amount of energy and resources, because it simply needs 5% of the energy used in the traditional process. We’ve seen the most important aspects of this process. It saves resources, energy and helps our planet. It also represents a great funding opportunity for local communities. It still has a way to go, because not all cans are recycled, but this percentage increases year by year.